Fast service and good food. Not a romantic date spot, but definitely a fun hot spot. Barrio Cellar is a great place to go to on specific days for their specials. 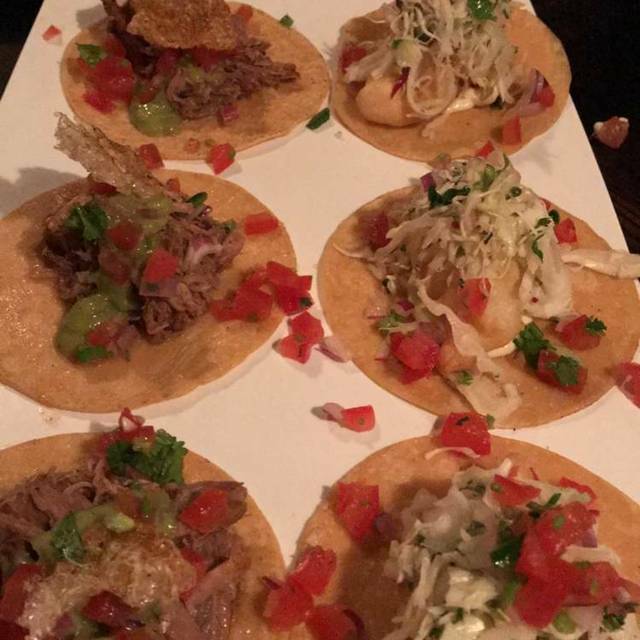 I went on Taco Tuesday and you won't find better tasting tacos in Sydney. Yummy food-just discovered this restaurant. Had visited Barrio Chino in the Cross so this was a good find. Great value on $3 taco night and also tried fried chicken- very yum. Very busy and noisy but this is a sign of a good place. We’re a little older so will next time ask for a chair or stool with a back. Definitely recommend for good Mexican. I love coming here, especially for taco tuesdays! They're amazing! But the service really lets it down and it is not the first time I have thought this. I understand it is one of their busiest nights, but it gets really really tedious when you have to wave someone down EVERY time (even just to order food) which makes you feel like a bit of a nuisance. Thanks for your Feedback- yup Tuesdays are busy. Staff rostering always starts solid, sometimes last minute things happen are out of our control - noting the date you visited- two members of our floor team unable to get in for their shifts- no excuse of course and when your hungry and want to order multiplied by cant get any service it can be annoying;.. Please know that at anytime as we are a bar/rest you are always welcome to order from the bar where service is very fast. Apologies though! Love this place , took froends there and warned them about the loud music but it wasn't as loud as last time I was there . So everything went well . Food and music great . Nice underground joint to get a quick bite to eat. Service was quick and food was tasty, very cheesy and you won't complain about a lack of sauce! It does get quite loud but if you're just up a little something between bars this is a great place to go. Amazing food drinks and venue!!!! Service was excellent. Burger and beers were good. Chips were cold. This place is always a great place to have a nice, casual meal with some friends on your lunch break or even just have a few after work drinks and a bit of a boogie at the end of the week! The staff are always friendly and helpful. I've become such a frequent visitor that they now know my order - tuna poke wonton nachos everytime. Divine! Great food and service from the bar. But very noisy (and that was with restaurant <20% full) and very expensive for what you get. Love the tuna poke wontons! It’s become a weekly lunch spot for me. Highly recommend Barrios Cellar , no pressure on ordering all your food at once , time to graze while having conversation and enjoying the Ambience. Great alcoholic list and food was tasty. I have already recommended this place to two friends. Amazing food as always. Friendly service, just slow especially since we weren't there at the busiest time. But definitely recommend! The waiter was very accommodating with our cake that we brought and he also brought out sparklers when presenting the cake to our friend for her birthday which was a nice touch. Was WAYYYY to loud could not have a conversation at all. Went early at 6:30pm. Really nice food but was ruined by the noise level. Ive been here on a friday and it was full off life and energetic. the tune poke was amazing. went on this occassion on a saturday and very quiet and poppers were not great at all. i think its a case of finding the right night and as a grroup location its good. service on both occassions is good. Great atmosphere! Went there for Taco Tuesday, but was a bit disappointed in some tacos which weren't warm, and the order taking a long time to arrive. Cheesburger tacos are excellent though! We had a very unfortunate experience at Barrio Cellar. We had friends visiting from overseas and booked a large table in advance. We were seated at two tables and not served for quite some time, had to get our own menus, water etc. The waitstaff were very nice but clearly too busy. With a table of 9 people, we had two meals come out fairly quickly, followed by another two about 20 minutes later. We waited another 20 mins or so and chased the rest of the food. Some more came out but still not all of it. We had to question waitstaff multiple times and eventually found out there was a mistake in the kitchen. We then had tacos come out that were all meant to be the same kind however looked completely different to each other (some without sauce / garnish some with etc). We simply asked which kind of tacos they all were and the manager had to come over to tell us they were all prawn. When we asked why some looked so different, he said he would "break them all open to show us they were prawns if we wanted" - very strange behaviour for a senior staff member. Lastly, when we were leaving, we were charged a service fee of 10% for a large group despite all the issues (and having nine people on two seperate tables, served separately). It's a shame as we have had a good experience there before but it really ruined our catch up with friends that we have not seen in a long time. Must go for any tequila lover. Cocktails are fun and delicious and the food is awesome. Terrible customer service, food was lacking, the wait staff were unable to get our very simple orders right then overcharged us for incorrect food. This is the second terrible experience we have had here and definitely will not be returning. Our second time to Barrio Cellar and the first time having food. They have excellent and varied handcrafted cocktails and the taco Tuesday special certainly filled the bill. We enjoyed them so much we ordered seconds! There was a 10% surcharge on top of the bill which I was not informed of prior to making the booking. We had a group of 7 people. The food is consistently good especially the burgers and the waitstaff are efficient and helpful. They can handle groups but on this occasion they forgot two of our dishes. They split bills too which is handy. Good dance music on a Friday and Saturday night to shake off all the calories! Always love the place and the ambiance however found the venue way too hot on this particular Friday night. Not sure if the AC is broken or anything. Half of my guests left early because of this. The staff there are great, the managers remember your name and always try their hardest to look after you. The food and drinks come quickly and taste amazing. Especially the burgers! Great food and service! Really good atmosphere! I would definitely recommend to friends! the atmosphere was the highlight. the dim lights, subtle chatter made a really cool vibe fora tuesday night. food was fantastic aswell. Love the food, and great service. Perfect for drinks with friends, wouldn’t recommend for intimate conversations as the music can be quite loud. The quesadillas are perfection!